Are you looking for a fun approach to antonym practice? Students might really enjoy this freebie. Who needs a tedious worksheet when students could be engaged in a cooperative game? This game requires reading, thinking, staying focused and relying on each other to finish the game?! 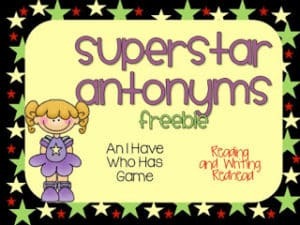 This free superstar themed activity will help your students practice antonyms. It has 12 cards and is perfect for a small group for extra practice or students can work on it with a few friends as a choice! I would recommend having an adult work with students the first time you run through this. You could do it at the teacher table or if you are lucky enough to have a teacher aide or parent volunteer during reading class or centers, they could run it. The first time you could etiher split the class in half, or have a group of 6 with each kid using two cards. If you don’t know this game, one card says “Start here” and that kiddo reads the card first. The card will say something like “I have cold. Who has the antonym of asleep?” Classmates will read their own cards (Before the game tip: I have them read the cards. If they are not sure what they say, they may ask for help. They can ask a neighbor or teacher for help reading the cards.) and look for the match, it “I have awake”. Then they read their card and the game proceeds until the person with the last card reads, “I have the last card”. Occasionally I will time a game and challenge kids to switch cards. Then they do a second go round and see if they can beat their previous time. Click here or on the image above to download it. If you have a moment to leave feedback, I’d really appreciate it! If you enjoyed this freebie, you might also like this Homophones interactive notebook activity. Homophones are really tough and kids definitely need extra practice. It has a soccer theme and is another non-worksheet approach to practicing tricky grammar. Click here to grab it.